These Soft and Chewy Fluffernutter Cookies are utterly irresistible! 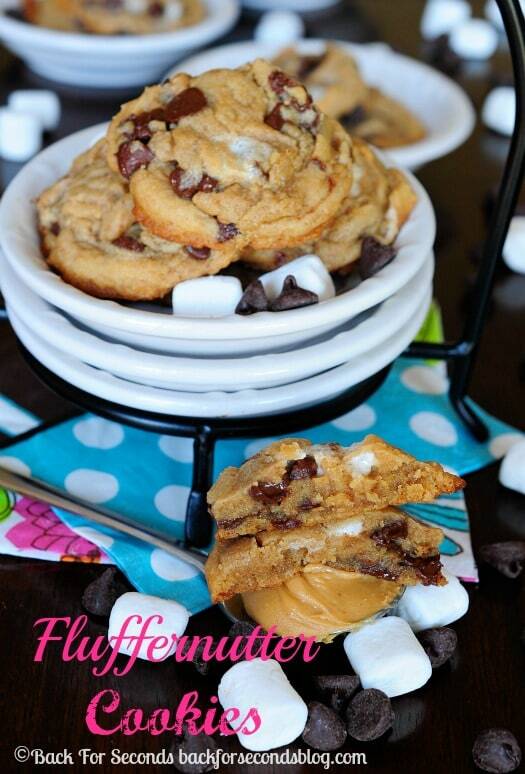 Ultra soft peanut butter cookies loaded with marshmallows and chocolate chips. Divine! 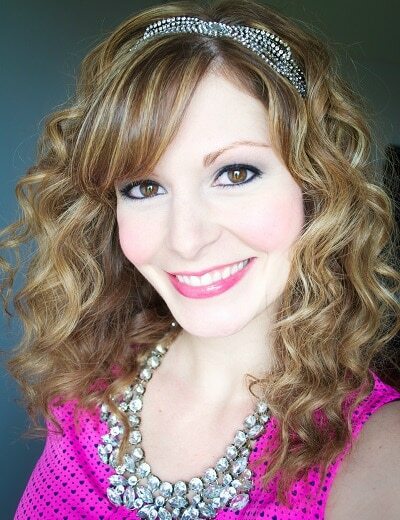 Today I am taking the classic fluffernutter and bringing it to a whole new level! These Fluffernutter cookies are gooey, melty, soft and chewy, and they are a favorite in our family! These cookies are like the perfect marriage between soft baked chocolate chip cookies and a fluffernutter sandwich! 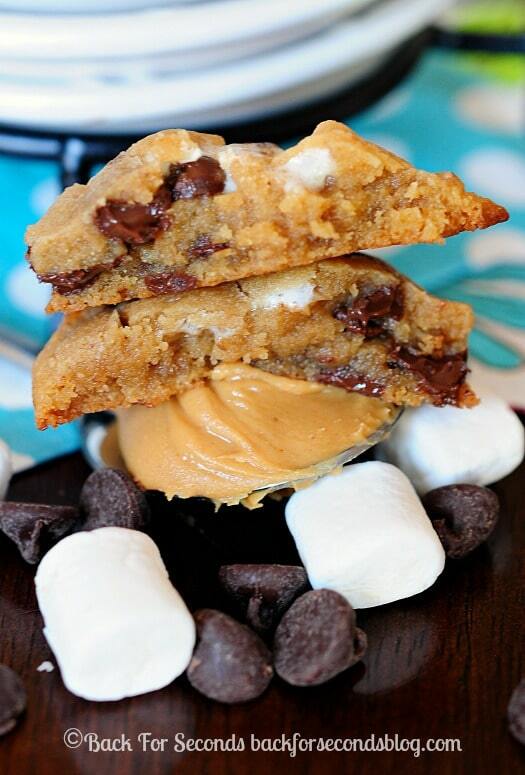 Peanut butter, chocolate, and marshmallow come together in a soft, gooey cookie you won’t be able to resist! Seriously. Good luck not eating the whole batch at once. These are dangerous. These are super simple to make, but there is one thing to keep in mind. 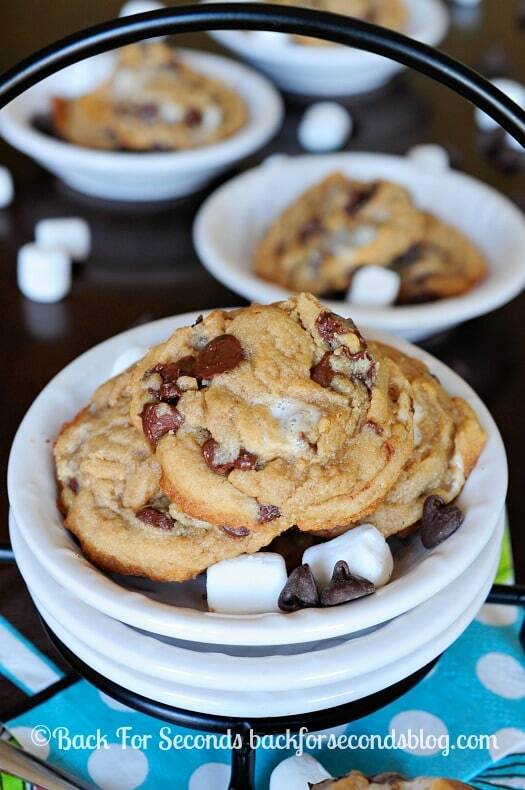 After you mix up the dough and scoop it onto a cookie sheet, press a few marshmallows into each cookie. Be careful to not get marshmallows on the edges because they will melt and caramelize on the cookie sheet. We don’t want that. We want super soft cookies here! My goodness, these cookies look amazing! Pinned it and plan to make these! Thanks for sharing! Am I missing the step about peanut butter? When do you add the peanut butter? Are these more of a batter cookie or a dough cookie? 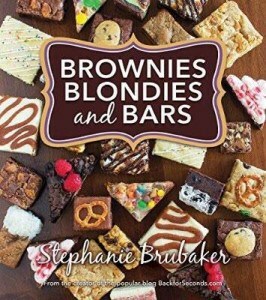 I’m looking for cookies that I can make the dough and freeze till I need to bake them. Thanks a bunch! Thank you. I actually added the peanut butter half way through adding the flour (because I was elbow deep in making the dough and realized that it was flour time and I still had my 1/2 cup of peanut butter sitting on the counter, un-added). So I just tried to mix as gently as possible and then added the rest of the flour. They turned out delicious! Thanks for the recipe! I make tons of cookies every year and so far *fingers crossed*, I haven’t had any problems freezing any of the dough, even the more “batter like” dough (which I wouldn’t consider this dough, although it is a tad on the soft side). I just refrigerate it first overnight (protecting it as much as possible with plastic wrap and freezer zip-locks) and then throw it in the freezer the next day. As a matter of fact, I baked these cookies after refrigerating the dough overnight (because that’s how I always do it) and they were unharmed. 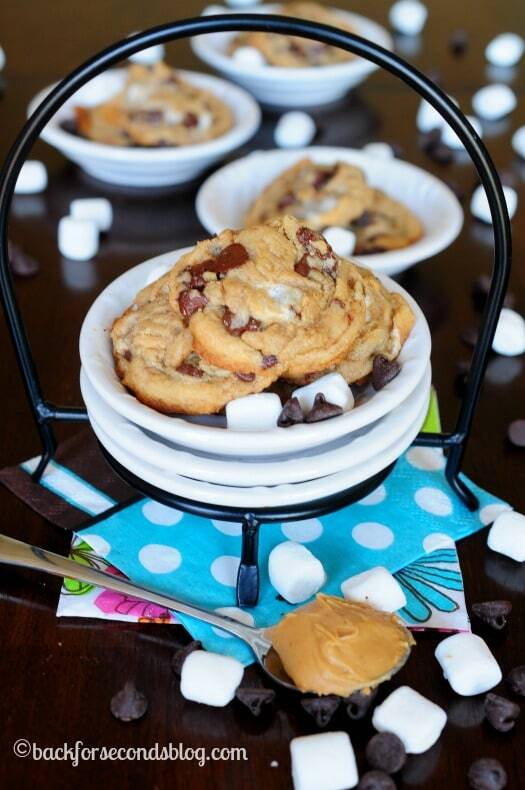 The only thing I would say is to let them come to room temp when you use the dough because of the marshmallows. They are so fragile after being immersed in the dough and they will tear apart pretty badly when scooping the dough if it isn’t completely soft. Hope that helps! These look amazing! Do you measure the coconut oil melted or solid? Thank you! I measured it solid. Enjoy – these are one of our favorites! The recipe can be found here http://backforseconds.com/soft-chewy-fluffernutter-cookies/2/ I hope you and your grandchildren enjoy them! Ok I’ve made this cookie recipe twice and though tasty they do not look like the picture. I have to bake longer than seven minutes, more 10-12 minutes. They are also a lot flatter. Again tasty and they never last long! Just curious is anyone else had this issue.